Malawians are furious over their president’s frequent trips to Nigeria where she is alleged to be secretly in love with Nigerian televangelist TB Joshua. Since taking over office after the death of former President Bingu Wa Mutharika, President Joyce Banda has visited Nigeria six times in 20 months she has been in office, mostly on a ‘private vocation’. So when yesterday state media announced the seventh trip, Malawians on social media were intrigued. â€œHer Excellency, the State President, Dr Joyce Banda leaves the country tomorrow, 27th December, 2013, for Nigeria, on a three-day private visit,â€ reads the press release that was signed by the Presidential Press Secretary Steven Nhlane. But it is the political connection between Banda’s rule and the Nigerian pastor that even more bewilders. TB Joshua had predicted the death of President Mutharika, allowing Joyce who was then Vice President to ascend to power. In one of her visits, she was captured in the flamboyant preacher’s television network – Emmanuel Television. Today’s trip that will take three days has led to social media tidbits. 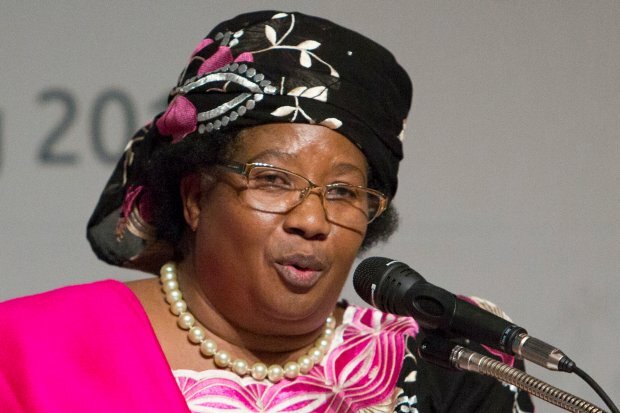 One blogger wrote â€œThis will be Joyce Bandaâ€™s seventh trip to Nigeria since ascending to presidency. What is in Nigeria? How special is Nigeria to Banda?â€ Others openly claimed she is visiting the preacher ‘because’ the country is preparing for another election where she may be be dethroned. The Malawian leader has been accused of ineptitude and failing to run the government. Recently, she had to sack her entire cabinet and reconstitute the government. While in Kenya recently, the Malawian leader revealed she had stayed in Nairobi’s posh estate Kileleshwa and maintains close friendships with a host of Kenyans, including Kenya’s first lady Mama Ngina Kenyatta, mother current president Uhuru Kenyatta. Meanwhile, her partyâ€™s vice President Cassim Chilumpha has resigned from the party over a remark made by a party member that President Banda does not like Chilumpha.